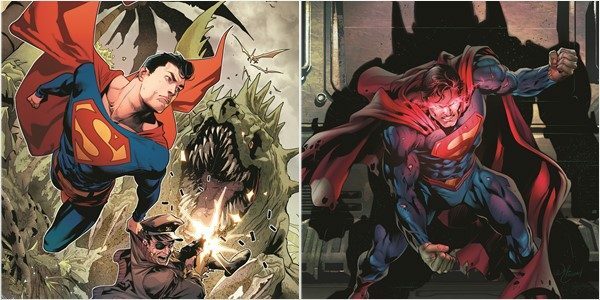 The creative talent of ACTION COMICS writer Dan Jurgens and the SUPERMAN team of Patrick Gleason and Peter J. Tomasi have brought legions of Superman fans story after story filled with action, humor, emotion and candor–traits that have continued to present Superman as an enduring symbol of hope, optimism, truth and justice. This May, the conclusions to their epic runs serve as the centerpieces of two special one-shot issues. On sale May 2, the 48-page ACTION COMICS SPECIAL #1 features “The Last Will and Testament of Lex Luthor,” written by Jurgens with art by Will Conrad. Beginning with the events of REBIRTH, Superman’s greatest enemy became his most unexpected ally. Is Lex finally on the heroic path, or is he still hiding his true colors? When he finds himself in an adventure where Superman could be destroyed, what will he do? Save the Man of Steel, or witness his demise at the hands of an unimaginable enemy? This oversize special also includes stories from Max Landis and Francis Manapul (TRINITY, JUSTICE LEAGUE: NO JUSTICE) originally slated to appear in the DC UNIVERSE HOLIDAY SPECIAL 2017 #1, and Mark Russell (THE FLINTSTONES, EXIT STAGE LEFT: THE SNAGGLEPUSS CHRONICLES) with artist Jill Thompson (WONDER WOMAN: THE TRUE AMAZON). Available May 16, SUPERMAN SPECIAL #1 features Tomasi and Gleason’s “The Promise,” concluding a story from REBIRTH that began in issue #8, 2016’s “Escape from Dinosaur Island.” Before Superman’s world goes through some drastic changes, he has unfinished business to attend to on Dinosaur Island. Superman and the Losers’ Captain Storm take one final trip together into the abyss of tomorrow, which brings the military man out of time into the world of today. This 48-page extra-size special also features bonus stories by Mark Russell with art by Bryan Hitch and Ian Flynn with art by Kaare Andrews.